In my search for a coffee and banana cupcake, I decided to try the following combination. Mocha cupcakes from Genius of a Cook: Obviously I did not use the Kahlua frosting, but I can say that these are the best mocha cupcakes. They were so soft, delicate and moist and had just a hint of coffee. I would have liked a stronger coffee flavor, but maybe my brewed coffee should have been stronger. A personal note on these cupcakes – the recipe, I believe, should yield 12 cupcakes if you fill the liners 3/4 full. I did fill my liners to that recommended level, but had overflow while baking. If I make these again, I may try filling the liners a bit less than recommended and end up with a couple extra cupcakes. Banana frosting from Chef Lilian: I was a bit disappointed with this frosting. While it did taste nice, it ended up looking nothing like the photo on the recipe page. It was very runny, too runny. After researching a bit more, I am wondering if that recipe could be missing an ingredient – perhaps, butter. Overall, a great tasting cupcake. In future, I might try baking these cupcakes again with Nutella frosting. 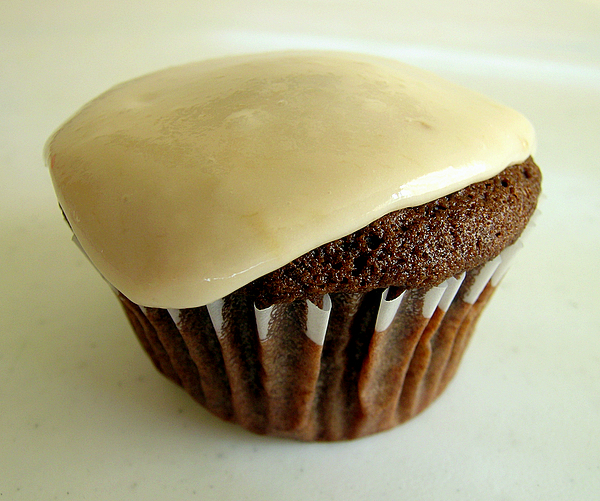 Also I will eventually try the reverse of this recipe – a banana cupcake with mocha or plain coffee frosting.